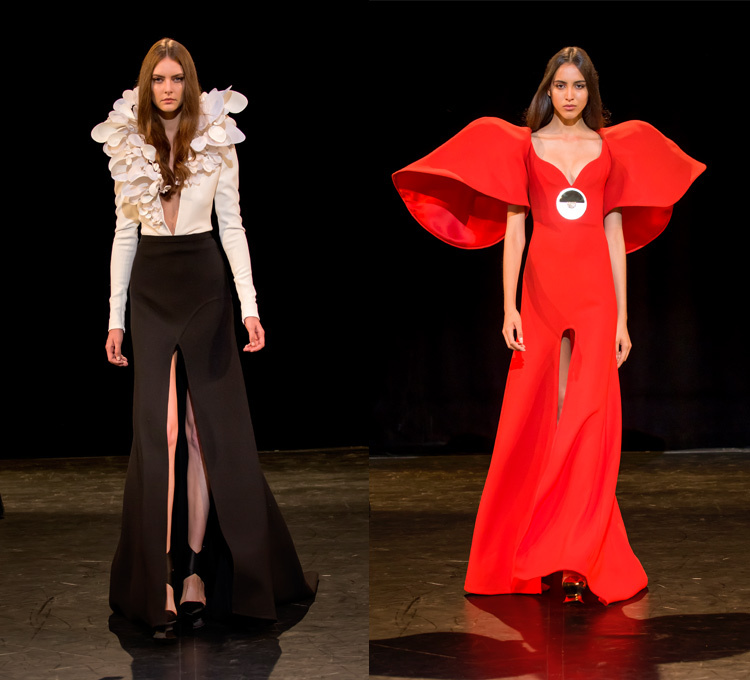 Creator of exquisite works of artistic fashion, Stéphane Rolland Haute Couture, one of the few members of the Chambre Syndicale de la Haute Couture, is deserving of the label. His mother who worked in photography shaped the way he uses contrast and color while his grandfather, a sculptor obviously formed how Stéphane Rolland’s truly Haute Couture gowns appear to be molded sculptures for women’s bodies. 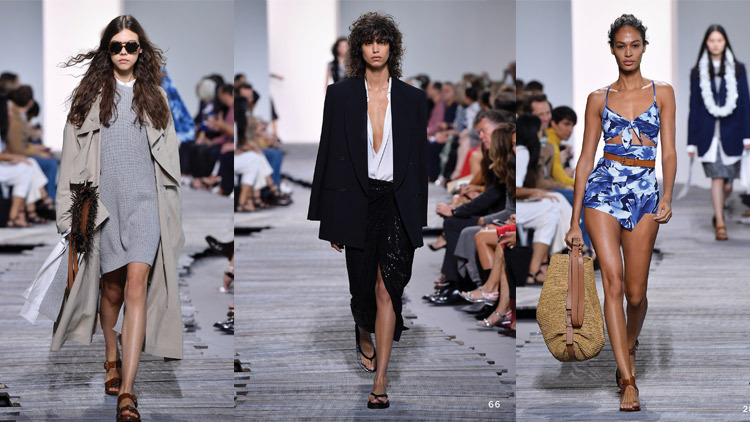 His pieces have been worn by British actress Emma Watson, Indian actress Sonam Kapoor, Nieves Álvarez the Spanish model, English fashion model Amber LaBon, the Icelandic singer-songwriter Björk and the Princess of Venice and French actress, Clotilde Courau, to name a few. 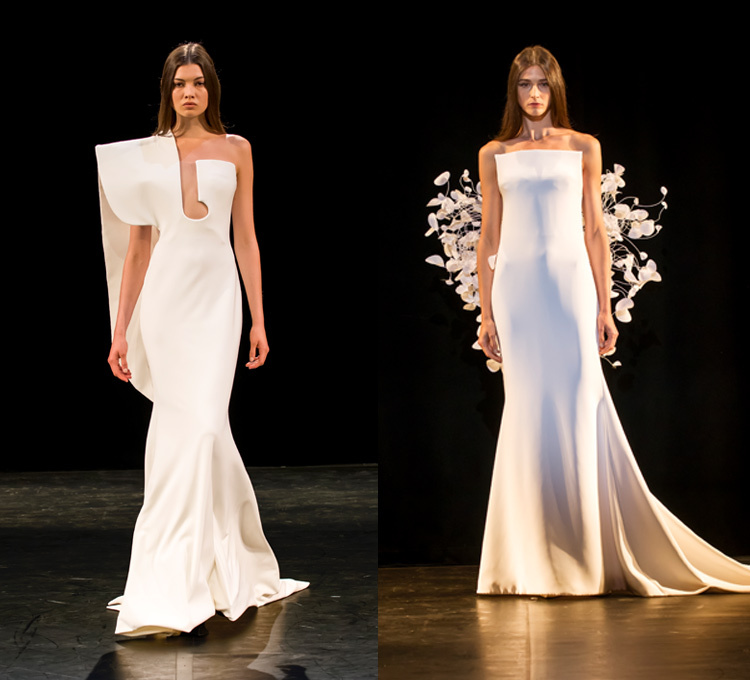 See the poetic Stephane Rolland Haute Couture winter 2017/2018 collection. A stroke, a circle, a square. 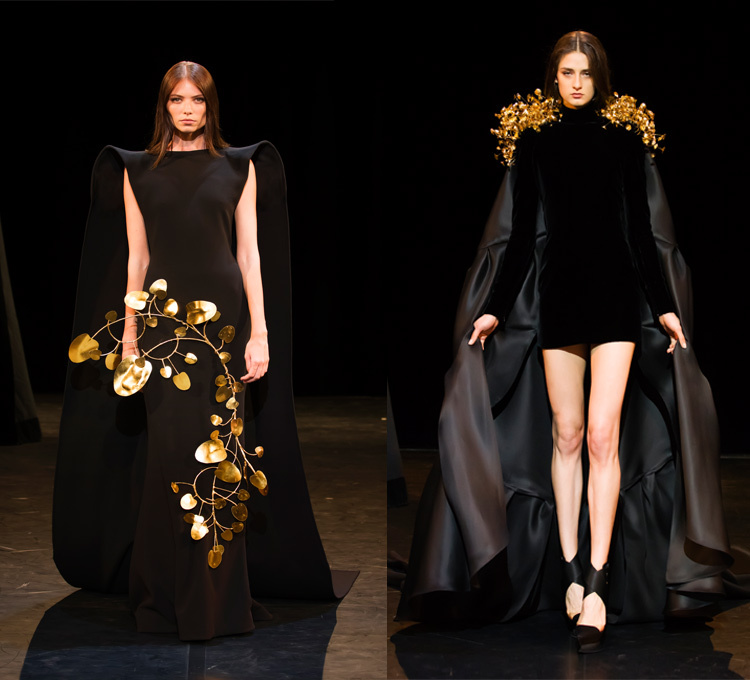 On a caped-dress in black crepe with pagoda-like shoulders, golden branches get tangled in, one of the many interpretations of the work of the American duo, Kurt Freiler, and Jerry Fels. Shoulders spread into curves and skirts slowly widen. Under deep openings, the body reveals itself. The allure is grand, determined. 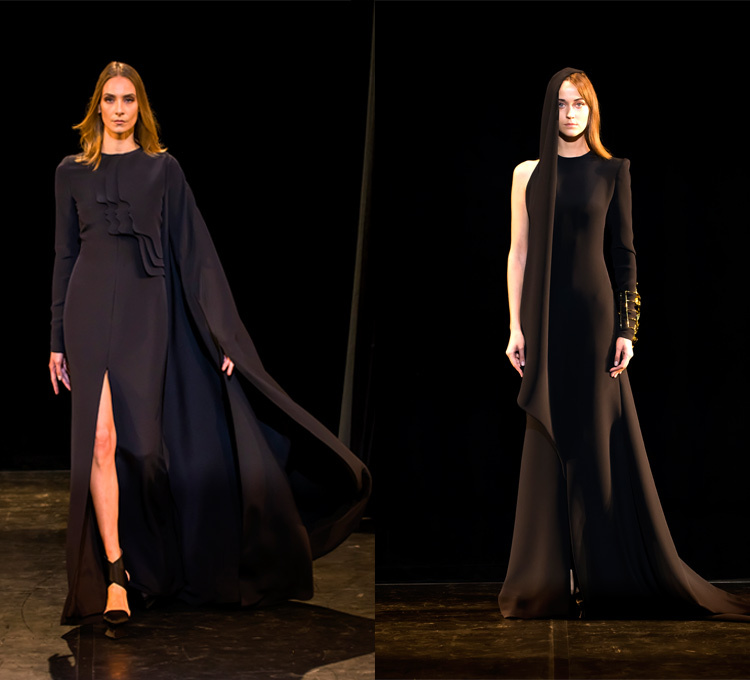 Power and seduction at their pinnacle while keeping a hold on elegance and subtlety. Nothing is presumptuous nor given. Everything is yet to be unveiled. Another black stroke. A totem dress. Straight. A cubic train. 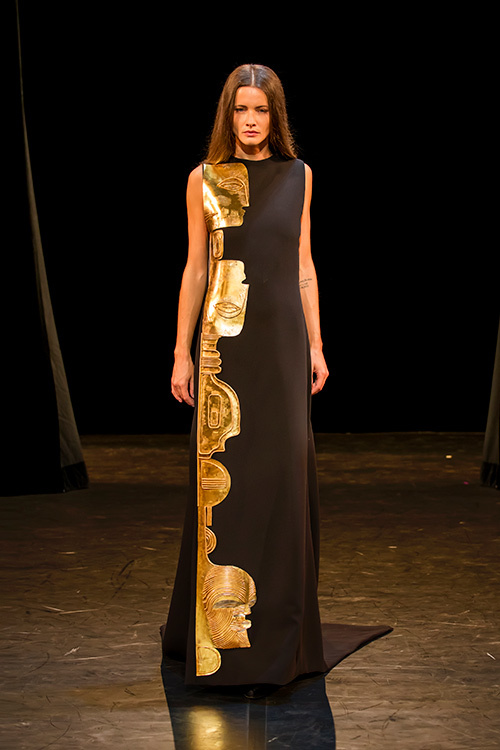 A gown embroidered with an aged golden column where faces are molded into silicon. A dedication to the Austrian sculptor, Franz Hagenauer. Two profiles cut in white crepe are facing each other above an Art Deco waterfall in black fox. An infinite silhouette in white crepe mousse breaks the purity with a monumental sculptural flight of black gazar. 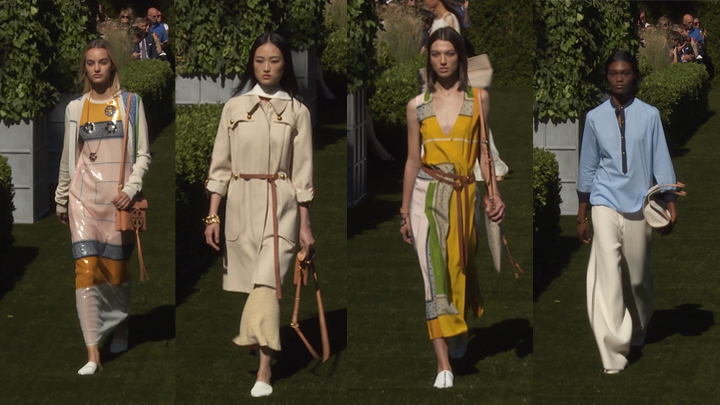 A single color, African lands’ ochre, disturbs the steadiness of my eteral black and white through a wide corolla dress with boundless sleeves. Read the collection like music on paper. Lyrical, searching for what’s fundamental, all the way to its roots. The fabrics, attention to detail and elegant draping are what make them highly coveted all over the world even in the Middle East where his only boutique is located in the Etihad Towers.